I just returned from a vacation up to Washington state. While I was there, I had a unique opportunity to visit a fellow Sim Pilot, Gordon. 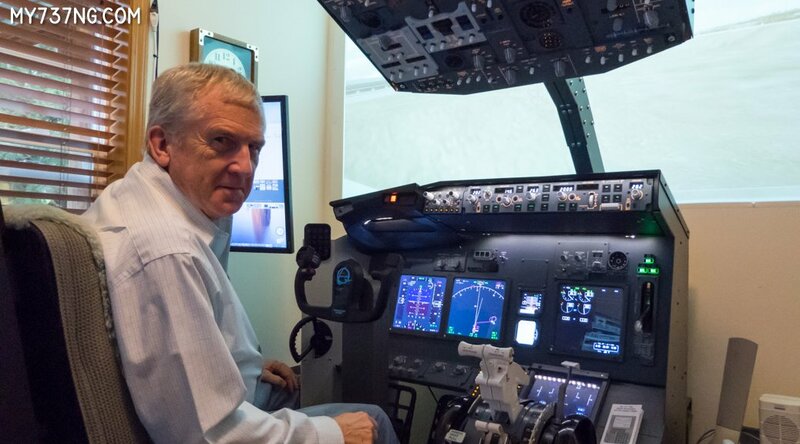 Gordon also owns a Boeing 737 home cockpit, found me via the website and even based his build on much of the information he found here. It is flattering that I am able to help others in this way! He is a licensed private pilot, retired a few years ago, and lives on 5 acres out in the beautiful rural countryside. I truly love the scenic Pacific Northwest and views like this explain why I go up there so much. 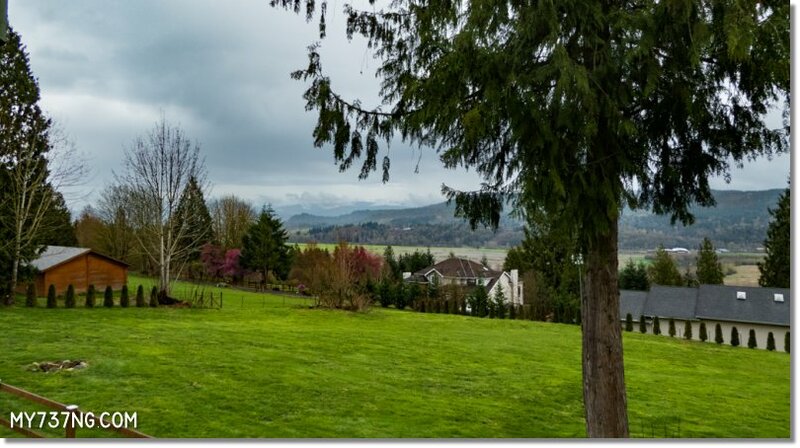 A view of the Washington countryside. 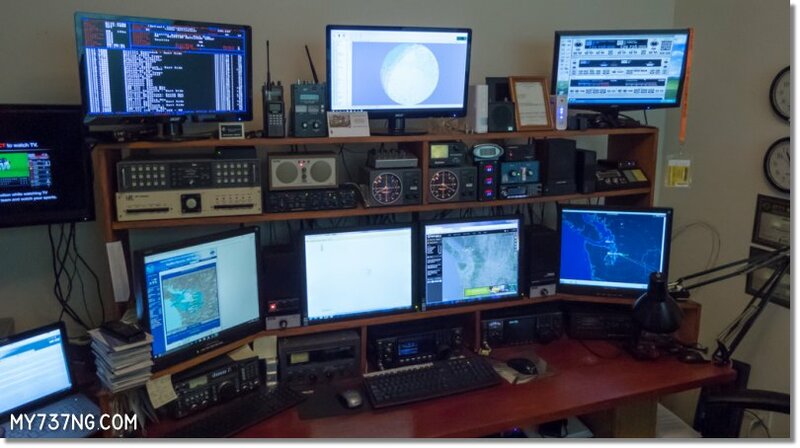 Gordon has been an avid HAM radio operator for decades and it is quite obvious he takes it very seriously by the look of his setup. I was blown away by the wall of transceivers, computers, monitors, and specialized equipment he uses to communicate with people around the world. He has dedicated a portion of it to real aviation such as multiple ATC and airline company radio scanners along with visual flight monitoring from FlightAware and FlightRadar24. He even has his own ADS-B monitoring station to track airborne aircraft transponders within about 80 miles of his home. It is a fantastic work of love! Sharing the same room opposite the radio wall, is his cockpit. Built on a similar platform to mine, he has the JetMax SKTQ with the new JetMax MX Series MCP/EFIS, JetMax Forward Overhead, and a real 737 avionics pedestal holding the JetMax MultiComm radio and JetMax transponder. His yoke and pedals are from Precision Flight Controls (PFC) while the chair is a real 737 first officer’s seat. The beamer is an Optima projector and he uses a monitor on the side for things such as the Sim-Avionics (Sim-A) avionics suite interface, Navigraph Charts, and more. Running it all is two dedicated PCs, one for P3D v3 and flight control inputs, and the other for the avionics, displays, etc. 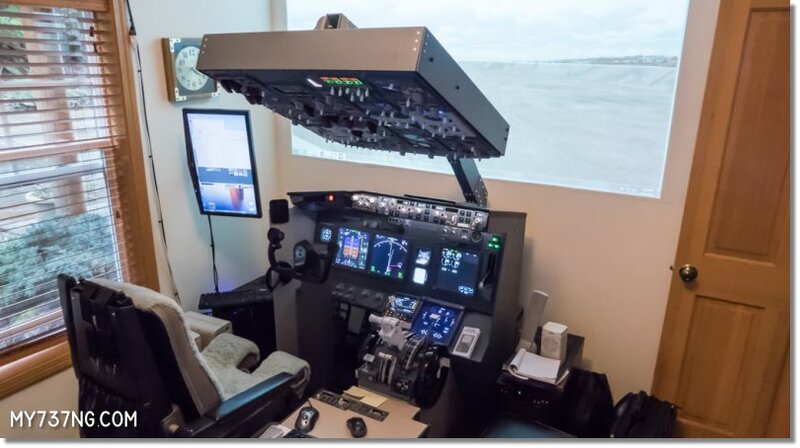 Another shot of Gordon’s home 737 cockpit setup. Gordon was curious about my thoughts on his sim’s operation, so I sat down and we set up a short flight from KSEA (Seattle) to Portland (KPDX). However, we couldn’t get any bleed air pressure from the APU to get the engines started. He was having to start the engines using the Ctrl+E keyboard shortcut, which ruins the fun. Turns out, there is a “Force Systems On” option in Sim-A that had mistakenly been enabled by a recent software upgrade. 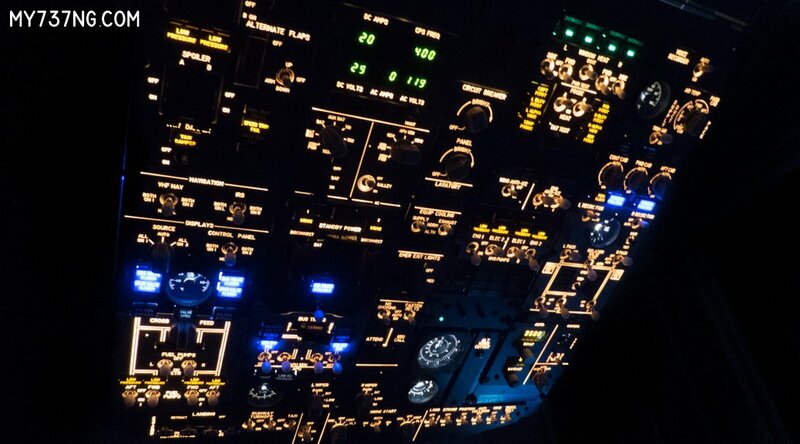 This is only supposed to be enabled if you do not have a hardware overhead panel. After disabling the option, the engines and JetMax overhead operated normally. Right off the bat, I really enjoyed the PFC Yoke. It feels very smooth with great switches and static feedback resistance, although the center pivot point is in the wrong place. The PFC pedals have very good toe brakes, but the rudder travel is somewhat limited. This would take some getting used to as it was quite easy for me to over-correct (you would have enjoyed watching my landing when I rolled it over trying to side-slip down to the runway). Interestingly, Gordon’s JetMax SKTQ was a little different than mine; he was missing the Yaw Damper gauge. Apparently, JetMax decided to stop including it as Boeing also stopped putting it in newer 737s. This also slightly changed the layout of the AFDS and nearby switches/annunciators. I did feel that his JetMax thrust levers had little resistance to movement. You could flick them and they would easily move a couple inches. In comparison, my own JetMax thrust levers are quite firm and do not move without meaningful effort, as in the real plane. This may just be a loosened fastener within the throttle quadrant and may be readily fixed. In the short time I spent with it, I did notice a few subtle differences between the ProSim737 and Sim-Avionics avionics suites. Sim-Avionics puts tiny clocks at the bottom of the PFD and displays the airspeed tape indicators in a different way. The airspeed also jumps around quite a bit, especially on takeoff. Sim-A does support a fully coupled passive-operational autoland, but the LAND 3 indication was removed since it is reportedly no longer displayed on the real airplane. I also saw that the ISFD in Sim-A looks a little different, along with the lower DEU display readouts for trim settings. Lastly, I saw that there were no indicators for N1 “thrust lever position” (which is handy for those of us without motorized throttles), but this is a user-configurable option in ProSim737 and may also exist in Sim-A somewhere. None of these are terribly bad things, just things I noticed while using Sim-A. 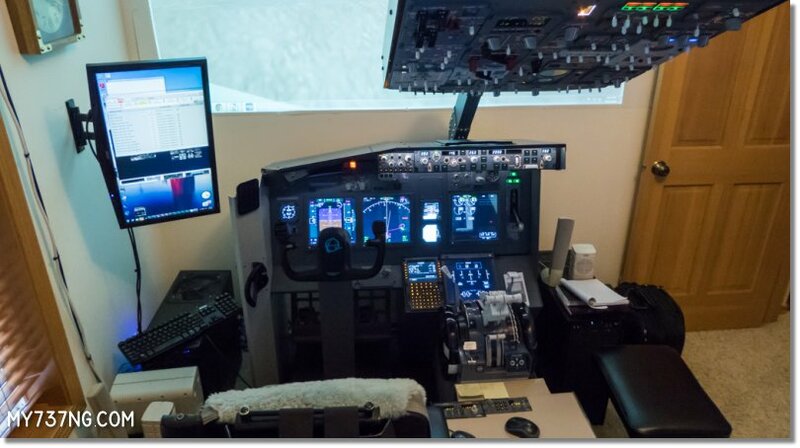 I then described my ProSim737 Instructor Station and what it can do and asked if he had the same feature in Sim-A. He was not aware of it, however, there is a Dispatch function within Sim-A that allows you to prepare the aircraft before a flight. Overall, Gordon’s home cockpit is excellent and pretty much all you need to get the most of the 737 flight sim experience. It felt good in the air and was easy to feel right at home. However, with all the issues he has had with Sim-A and their support, I suggested he try the 30-day free trial of ProSim737 and see if it works better for his needs. Unfortunately, both suites are very expensive and I would hate to think he has lost his investment in Sim-A. 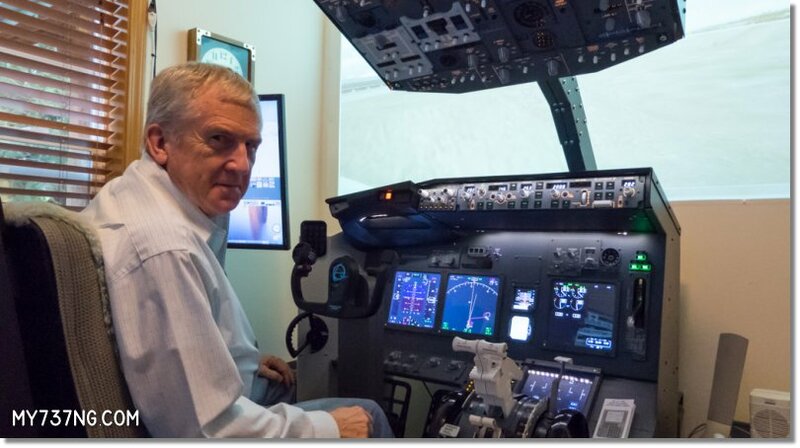 Gordon at the controls of his 737 sim. In the end, I want to extend a gracious thank you to Gordon for letting us into his home and even feeding us! It was an honor to have one of my visitors reach out and extend such an offer. If all flight simulation enthusiasts are this friendly, we really do have a great community and I am proud to be part of it! Disclaimer: The content written here is purely my own observations and opinions and in no way is a representation of Gordon or his own views. I recently went through my entire CPFlight FWD Overhead Panel and corrected the backlighting color to be more accurate to the real Boeing 737. It was not too difficult, but the results were stunning!